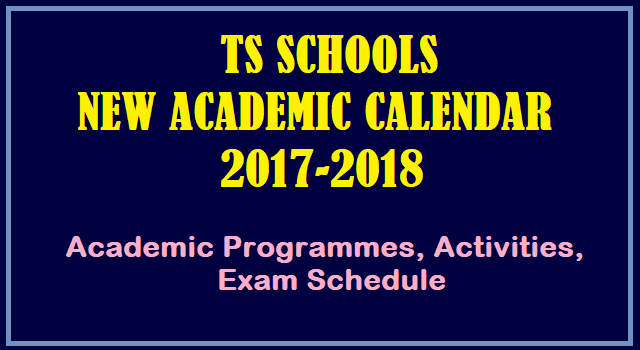 TS Schools New Academic Calendar 2017-2018 - Academic Programms, Activities, Exam Schedule:TS Schools New Academic Calendar Programmes, Activities Schedule 2017-2018 #TS Schools New #Academic #Calendar 2017-18 Programmes, Activities Schedule/ TS Schools Academic Year 2017-2018-FA 1,2,3,4 SA 1,2 Exams Schedule, First, Second Term Holidays,month wise working Days,TS Schools Academic Calendar for the year 2017-18 and other programmes, activities for the next academic year have been developed by the SCERT Telangana. In this Draft Academic Calendar 2017-18, Main Activities Schedule, Next Academic year start date, Summer vacation, Schools Reopening, Syllabus distribution, Examinations schedule, Term Holidays like First term holidays(Dasera), Christmas holidays for Christian minority schools, Second term holidays(Sankranthi) for Other than Christian minority schools, Summer vacation and Month-wise working days details are available. These details are given here. The draft academic calendar for the year 2017-18 have been developed and it is proposed for discussion for finalization of TS Schools Academic Calendar for 2017-2018. In a major change in the School Academic Calendar, schools will start on June 1 instead of June 12 next year. Also, for the next academic year, schools will commence from June 1 instead of March 23. According to new academic calendar for 2017-18 formulated by the Directorate of School Education and approved by the State government, schools will have summer vacation from April 13, 2018 to May 31, 2018. The change in the academic calendar has now paved way for school students to take part in the State Formation celebrations on June 2. Earlier, the schools used to re-open on June 12 and not much activity used to be conducted on account of the State Formation Day. The schools will have to complete syllabus for Classes I to IX by February 28 next and revision, remedial teaching and preparation for Summative Assessment (SA) 2 exams will be held during March and April, 2018. The SA 2 examinations will be held from April 2 to April 9 next year and April 12, 2018 is the last working day for all schools for the academic year. As per the calendar, the syllabus for Class X should be completed by January 31 and revision classes and pre-final examinations should be held before February 28. The government has given 15 days as vacation for Dasara festival for all schools starting from September 20 to October 4. Similarly, five days for Christmas holidays for missionary schools from December 24 to 28 and Sankranti vacation will be for five days from January 12 to January 16, 2018 for other than missionary schools. SA 2 : 02.04.2018 to 09.04.2018 Pre-final for Class X: Before 28.02.2018. 7. summer vacation: From April 13, 2018 to May 31, 2018. 1. The last day of working of Academic Year 2017-18 is 12/04/2018. 4. Syllabus distribution for AY 2017-18: The syllabus for all subjects is distributed from 12.06.2017 to 12.04.2018 [The syllabus was demarcated for SA1 and SA2 examinations]. The syllabus for all subjects for Class X shall be completed by 31.01.2018 and take Revision Classes and conduct Pre-final examinations before commencement of SSC Board Examinations. 5. Syllabus completion for Class I to IX shall be completed by 28.02.2018. The revision and remedial teaching and preparation of SA2 Exam will be during March and April 2018. Pre-final for Class — X Before 28.02.2018. July 2017 01.07.2017 31.07.2017 24 - FA1 : 12.06.2017 to 31.07.2017 ( 39 working days) - Students performance shall be recorded in the registers and Cumulative Records by 31.07.2017. September 2017 01.09.2017 19.09.2017 14 -FA2: 01.08.2017 to 19.09.2017 ( 37 working days) -Students performance shall be recorded in the registers and Cumulative Records by 19.09.2017. 1. High Schools: 9:30 AM to 4:45 PM and in case of Twin Cities of Hyderabad and Secunderabad, the High School timings will be 8:45 A.M. to 4:00 P.M.
2. Upper Primary Schools (Class VI to VIII) - 09.00 AM to 04.15 PM and in the Twin Cities of Hyderabad and Secunderabad, 08.45 AM to 04.00 PM. 3. Primary Schools and Primary Sections of Upper Primary Schools (Class I to V) 9-00 AM to 04.00 PM, and in the Twin Cities of Hyderabad and Secunderabad, 08.45 AM to 03.45 PM. 4. The Primary Schools and Upper Primary Schools working in the High School Campus shall follow the High School Timings i.e., the Primary Schools from 9:30 AM to 4:30 PM and Upper Primary Schools will be from 9:30 AM to 4:45 PM. The Residential Schools, KGBVs shall follow their own Time Table. 1 Class — X 10.30 a.m. to 11.15 a.m.
2 Class — IX 11.30 a.m. to 12.15 p.m.
3 Class — VIII 2.00 p.m. to 2.45 p.m.
4 Class — VII 2.45 p.m. to 3.30 p.m.
5 Class — VI 3.40 p.m. to 4.20 p.m. While developing the Time Table, a period is shown for Digital Class for every subject (er,. model Time Table and Schedule will be communicated by Director, STET from time to time). It is decided that, the existing practice of OH to the Schools needs to be changed and the teachers will avail OH rather than whole school in case of High Schools only. However, the availment of OH Shall be limited to 30% of the teachers on any given OH. The discretion of sanctioning 30% OH to the teachers will be with the Head Masters / Principals concerned. For the Primary Schools and Upper Primary Schools the existing system shall continue. This Academic Calendar will be followed from the current Academic Year, 2017 -18.